This is the summary of consumer reviews for OK to Wake! Children's Alarm Clock and Nightlight. The BoolPool rating for this product is Good, with 4.00 stars, and the price range is $29.95-$37.99. The OK to Wake! Children's Alarm Clock and Nightlight is battery operated dual color clock that emits soft yellow color at the tap of a button in the evening which is also a comforting night light and turns green in the morning indicating 'Ok to Wake Up' time programmed by elders. There are cute toe buttons on the clock and it displays funny facial animations on the LCD screen. The settings can be customized by selecting the independent nap timer for the afternoon without changing the usual alarm. The built-in alarm clock helps growing up kids in gradual wake up and getting used to tones to a full sound alarm, accompanied by fun animations and snooze button. The clock comes in two interchangeable faceplates, adorable pink flower (for girls) and green bug (for boys). Some reviewers experienced that the coils to hold battery are pretty loose and the battery pops out upon the slightest drop or putting down hard, thus leading to freezing or auto resetting of time. Also, the 'Ok to Wake' light changes from yellow to green in a pale shade which is hard to distinguish. Overall, the OK to Wake! 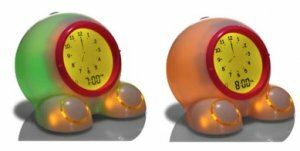 Children's Alarm Clock and Nightlight makes a fun and functional addition to any child's daily routine. It is perfect clock to give that extra morning tension free sleep time to kids and parents. It is suitable to introduce wake up practice among children and the digital reading makes it easy to give time reading coaching to starters. This product has worked out well for us. I think this's more an issue of a head-strong daughter than an issue with the product!. I didn't realize this product Only runs in AA batteries. Within 5 minutes of opening the package, the product had reset itself twice. The coils that hold the batteries are very loose and any time it's dropped/put down hard, the batteries come loose and the clock resets or freezes. My 2.5 year old daughter loves it and is so excited when it's "wake up time" and her clock is green. We love that it's battery operated -- waiting to see how long the batteries last in practice. Very happy with this product!. I bought this product for my 3 yr old son. I wouldn't recommend this product for children under 5. This alarm clock really helped my son learn to stay in bed and sleep longer. She waits for the green light until leaving her room. Our daughter now literally will stay in her room until the light is green. Highly recommend it for any early risers. It's very simple to use, easy to toggle to nap mode and doesn't have any extraneous sounds or lights to interrupt sleep. We only use the green light feature and not the actual alarm. When the light is actually green, i ask her "what color is your light?" After two days of training my son doesn't come out unless he sees the green light! If its not green and you let your kid out, the sleep training won't work. He comes running in my room, "light came on! She stays in bed until 8 and is excited every morning to come in and say "my light turned green". He's very proud of his "big boy" alarm clock and proudly yells, "It turned GREEN!" at wake up time. By day 5 she was staying in her bed and playing until the clock turned green. The nap button is basically a timer that turns the clock green in the time you decide. He loves to see the green light and crawl out of bed and say "time to wake up" to himself (which we can hear on the baby monitor)! Over the past five months the clock has worked sometimes and other times my granddaughter has awakened way before the set time and not stayed in her crib quietly. FYI - the default amount of time it stays green is 30 minutes but you can change that so that it'll stay green up to 2 hours (or as short as 15 min). We bought them for our 3 yr old twins who were having a hard time adjusting to the end of daylight saving time this fall. Sometimes the buzzing alarm gets turned on and I don't notice at the time thus waking my sleeping child. This clock is perfect for teaching our 3 1/2 year old when it's time to get out of bed. When the light does turn green he comes running downstairs saying, "my light is green, my light is green!" We explained how it worked to my 2.5 year old son and demonstrated the green light a couple of times at dinner time. The concept of "Green Light" means "ok to wake" was easily understood by our 4 year old and it helps her to know clearly when nap time and bed time are over. The light turns from yellow to green, the difference isnt obvious enough to notice. Lots of features - regular alarm clock, light-up time, light up duration, brightness adjust, nap timer, etc. It's not intuitive, so just read the manual thoroughly!. My only wish for improvement in this product is a way to manually turn on the green light. It doesn't really glow yellow or green, just a pale shade in between and it's really hard to distinguish between the 2 colors (no I'm not color blind) A simple red light / green light would have been much more intuitive and simple. I use this product for one purpose: to turn green at a specific time in the morning in order to indicate to my four year old what time she can wake up. We try to tell him to stay in bed until the light turns on but he gets confused and turns on the night light "which is yellow, but close to green" and tells us it's good to get up. We're using it also to help her learn to tell time, but until she can read it clearly, the green light is perfect.